Solids having irregular shapes of particles are known as Amorphous Solids. The word ‘Amorphous’ came from Greek ‘Amorphos’ which means no shape. The constituent particles of amorphous solids have only short range order of arrangement, i.e. regular and periodical arrangement of particles is seen to a short distance only. The structures of amorphous solids are similar to that of liquids. Glass, rubber, plastics, etc. are some of the examples of amorphous solids. Amorphous solids are isotropic in nature, i.e. physical properties of amorphous solids are same in all directions. In old buildings, it is often seen that glasses of windows get slightly thickened at bottom, this happens because glass which is an amorphous solid; flows down very slowly. Some very old glasses get milky appearance because of some crystallization. This happens because on heating, glasses get crystallized at some temperature. 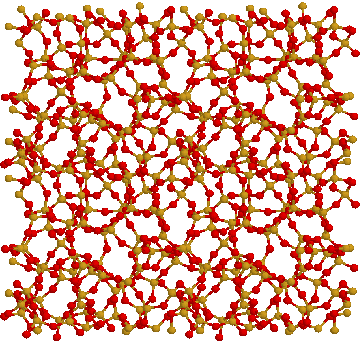 This is the cause; amorphous solids are also known as Pseudo Solids or Super Cooled Liquids. Particles of amorphous solids are irregular in shape.Amorphous solids soften gradually over a range of temperature.Amorphous solids produce pieces of irregular shapes when they are cut into two pieces.Amorphous solids do not have definite heat of fusion.Amorphous solids are isotropic in nature, i.e. they have same physical properties in all directions.Amorphous solids are not true solids and hence these are also known as Pseudo Solid or Super Cooled Liquid.The arrangement of constituent particles is in short range order.